My son Josh and I made a trip to the Chaos Communications Congress today (aka 25C3). It’s a hacker conference that takes place in Berlin in late December every year. Here’s the schedule of today’s talks. We had our choice of hearing about hacking rich internet apps, flying in unpowered aircraft, and exploiting the Symbian operating system. Josh was curious if he could hack into Facebook but we quickly realized that the hacking rich internet apps talk was way above both of us. The unpowered aircraft talk was easier to take in but it was mobbed and we couldn’t get a seat. There were some cool things to play with. People were hacking locks in the cafeteria, there was a huge lego project in the back of the cafeteria, and a bunch of electronics projects to look at. Josh was into the rotary phone that was connected to an old mechanical switch. When you dialed the phone, you could see how the old mechanical phone sytem worked. That was an eye opener for him. Mostly, however, the conference was about hanging out with other hackers and working on stuff. I’ve never seen so many laptops opened at a conference before. I think Josh and I were the only ones there without one. I was hoping to hang around long enough to see my friend Christophe who had suggested we go to 25C3 in the first place. But wihtout our laptops and some real hacking to do, we lost interest after about an hour and hopped onto the subway and to the Gendarmarkt for some lunch. I’m a huge fan of hacking and hackers and it warms my heart to see so much passion and energy for "breaking and rebuilding things" as one of the presenters described the hacking phenomenon. I hope some of that rubbed off on Josh today. I was thinking of making a broader point in my "quill pen" post yesterday but ran out of time so I decided to do that with today’s post. Before the telephone came along, correspondence mostly consisted of letter writing, like the Adams/Jefferson letters I mentioned in yesterday’s post. The telephone changed all that and by the time I was born, in 1961, most people relied on the phone for their regular conversations. And in the process, we lost a bit of the art and pleasure of the written word. Writing became something authors, journalists and academics did and the average person didn’t do. We also lost the ability to record these conversations for posterity. Being able to read Adams and Jefferson’s words almost 200 years after they wrote them is an invaluable resource for society. The internet changed that, starting with email and chat. People started writing again. And the practice of everyman writing has picked up with texting, social networking, twittering, and most of all blogging and blog commenting. I am excited about the power of blog commenting to bring ‘intellectual discussions’ back to the mainstream. We’ve had forums on the internet for as long as I remember but they’ve been largely for a niche audience. Blogging has brought a more mainstream audience to the idea of ‘discussions’ but the friction in the system is still too large. Much of the friction is just inertia. I get so many comments that start out "long time reader, first time commenter". I try to reply to every single one of those because when they realize that leaving a comment is like starting an email discussion with me (and hopefully others), there’s a good chance they’ll be leaving more comments in the future. The recent addition of facebook and hopefully other profile systems (google’s system, linkedin, myspace, yahoo, etc) to disqus and other commenting systems will help. Nobody likes having to create a new profile just to leave a comment. But when you can leverage your indentity that you’ve already created elsewhere to quickly and easily leave a comment, that’s going to bring more people into the discussion. I was going through the comments to the ‘Bits Of Destruction’ post this morning and there’s this great back and forth between two frequent commenters about the bank panic of 1907 and JP Morgan’s role in it. That’s the kind of conversation that just didn’t exist for most people pre-Internet. You could get it in college dorms, bars and coffee shops in the right towns and cities to some degree, but certainly not late at night in your pajamas in your studio apartment. I think we are becoming a more literate and conversational society because of the internet. And the tools aren’t there to fully leverage this activity. But they are coming fast. It is something I am passionate about and invested in. I hope you are too. As I was reading Steven Johnson’s Invention Of Air, I became fascinated with the art of letter writing that existed during the time Steven chronicles in that book (mid 18th century to early 19th century). The legendary conversation conducted by Adams and Jefferson in their final years was conducted entirely via letters sent back and forth. And, of course, they were written with a quill pen. The other day, as we were walking thru one museum (I can’t recall which right now), my daughter Emily saw an antique ink fountain for a quill pen and said ‘I love these things, I want one". I guess she shares a fondness with me for the long gone art of writing with ink on paper. Yesterday’s post, Bits Of Destruction, generated quite a few comments and many of you were surprised that I could compose such a long post on my blackberry. 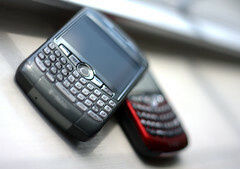 To one such comment, I replied that my blackberry is "my quill pen". I was only half joking. Though I like to write on a computer and mostly do, I really enjoy writing on my blackberry. For the past several days, I’ve been getting up before everyone else (as usual – but at 8 or 9 am instead of 5am), going to the gym, and then getting a cup of coffee in the hotel lobby and posting with my blackberry. I’m quite happy with the result. I’ve written longer and more thoughtful posts this week than has been normal and they’ve tackled a variety of subjects. I don’t really know why writing on a blackberry brings out this side of me but it does. It could be the lack of distraction (hard to multi-task on a blackberry), it could be that I can’t link out so I don’t bother to be referential, or it could be something else entirely. All I know is I feel very comfortable writing with blackberry in hand. Its my quill pen. Disqus, the company that provides the comment system on this blog (and a Union Square Ventures portfolio company) has added Facebook Connect support. What this means is if you have not created a disqus profile but do have a Facebook profile, you can leave a comment using your Facebook profile and you do not need to register with Disqus. I am sure for most of you this isn’t going to matter much since most of the commenters on this blog have already set up disqus profiles. But for new visitors, this is a nice feature. And it is the start of more Facebook integration for sure. The obvious next step would be to allow people who leave a comment with their Facebook profile to have that show up in the Facebook news feed. Daniel, the CEO of Disqus, as much announced that with this twitter reply last night. I logged out of disqus and left a comment on an earlier post with my Facebook profile and it works great. If you want to add Facebook connect to your disqus comment system, this blog post tells you how to do it.